coron it is! Banol beach i think.. Enjoy your time out, MM! Btw, is that Daniel Craig, 007? hoping to go back to coron this year. In Maui right now and your beach looks better than mine! I must go there! Coron! Can’t mistake those limestone cliffs for anything else. Hope you enjoy the trip! 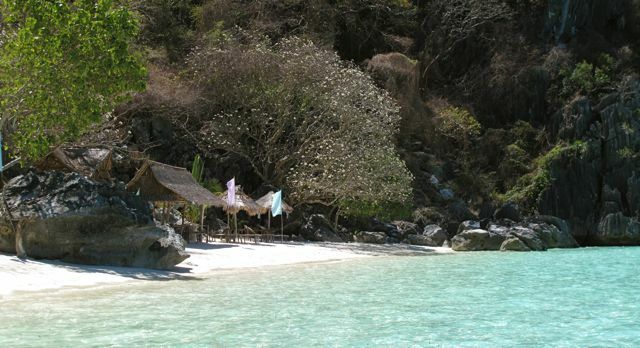 we filipinos are so damn lucky as we have the best beaches in the world…have fun MM.. Enjoy the R and R!! OMG!!! I want to go there!!! Especially in this kind of weather in NYC!! There’s snow everywhere. And we’ve been getting a lot this year, more than 30″ of snow in 3 weeks. What a bummer! Anyway, have fun MM!! Yep, it’s definitely Coron! And I have to be a little selfish when I say that I’m hoping that not a lot of tourists come this way. I hate to think it going the way of Boracay. Palawan is truly the last frontier of the Philippines. wow, i was just looking for beach photos from my own files last night to cheer me up in this dreary winter weather! this photo just made my day.thank you! i’ve never been to Coron although I’ve been to El Nido. our beaches are just awesome. and here we are in our 7th snowstorm—sigh—enjoy, MM and family!! love this place. can you provide me the details of this place? Living in dubai provides such little destinations and I miss the Manila friendliness. Ms Connie C…I am geographically challenged when it comes to our islands there. Is Coron close to where Hacienda Kudyapi is? If it is, luuuuucky! First time commenter…but have been enjoying your blog for a few months now. Thanks for posting and sharing! This makes me feel like i’m taking a 5 minute mini-vacation with you while stuck at work and can’t get away. I appreciate what you do by showing off the many beautiful and breath-taking places in the Philippines! bettyQ; Wish it were. Tell you the truth am still hoping to go there but to get there is a round about way, via Manila or by those low flying 6-8 seater planes (from Puerto Princesa where I am) which were suspended for a while due to a crash. T. People at the airport tell me they don’t even call out their flights when ready to leave at the airport. Perhaps with few passengers they know their departure time. Coron is way up north from Puerto Princesa which is halfway the length of the province. Six-pack abs ba yan MM ? Ay sorry, likod mo pala. :) Have fun. awesome place, hope i can get there too. Coron again! Wow, enjoy the sun and the sea(food), MM! MM I thought you blogged this particular article already? It looked very familiar! Sir you have an amazing blog, it makes me homesick sometimes surfing on it, but looking at the photos, the food and all of those stuff makes me happy. Thanks for the effort to always share. God bless you and you have a great! great! great! blog.